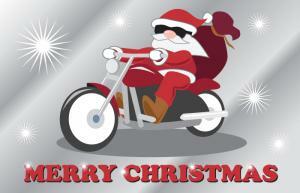 Christmas cards with motorcycles are a way for motorcycle enthusiasts to share their passion with friends and family. These cards are also a great choice for those looking for unique Christmas cards. Whether you own a motorcycle or not, Santa riding a Harley is sure to stand out amongst the nativity scenes and fireplaces on other cards. 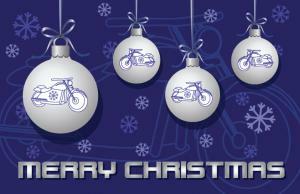 There are two downloadable Christmas cards here with a motocycle theme. These cards are free for you to print and share. If you need help downloading the printable cards, check out these helpful tips. While you may be able to find a few motorcycle Christmas cards at any card shop, for the largest selection, you'll want to check out a retailer specializing in motorcycle gear and accessories. The following online sources can start you on your search. If you prefer to send electronic greetings at Christmas, Dgreetings.com has several motorcycle-themed email Christmas cards. Some designs include music and animation. Add a personalized message, and send your card for free. Snow Gazer - A motorcycle rider waves to a snowman wearing a leather motorcycle jacket. From One Generation to Another - A father and son work on a bike in a Christmas-ready workshop. Capturing the Win - As Christmas lights shine in the background, a bike rider poses for a photo with his trophy. Holiday Wish List - A father and son look at motorcycles for sale, as if deciding what to ask Santa for Christmas. A December Night on Main Street - Two motorcycles pass in the night. A normal occurrence, except one of the riders is Santa. Christmas Getaway - A motorcycle takes a trip to a cabin in the woods for a peaceful Christmas celebration. Santa's Joy Ride - Santa is waving while riding a bike. This card features no mess glitter. American Holiday - An embossed card featuring a Christmas scene with trees and house and a motorcycle in the foreground. American Made - This is a vintage scene featuring a local hang out spot decked out for the holidays, and a group of bikes parked in front. Christmas Getaway - For the person who loves to get away from it all, a cabin on a lake with a motorcycle parked off to the side. Santa's Bike Shop - Features Santa reading a manual on how to fix a bike; this card has a very vintage feel. 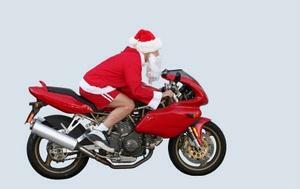 Santa's Toy Motorcycle - Santa is delivering toys in motorcycle rather than a sleigh. Here Comes Santa - Features a slihouette image of Santa and his sleigh across a moon - except he's being pulled by motorcycles rather than reindeer. Harley Santa and Reindeer Pack - Instead of pulling the sleigh, these reindeer are Santa's biking buddies. Santa and Custom Reindeer - A tricked out reindeer is ready for Santa's big night. Harley Davidson Snow Globe - A familiar holiday symbol, the snow globe, is turned into a Harley showcase. Road Race Santa - Santa rides a sleek racing bike, with gifts flying from his pack. Christmas Tree - Santa seems to have left someone a Harley under the Christmas tree this year. If you're looking for Christmas cards with motorcycles because you're a motorcycle enthusiast, why not show off your own bike? Digital cameras make it easy to take a picture of one bike or an entire collection. If you would like your cards to be professionally printed, employ the services of a local print shop or office supply store. However, most computer card-making programs can provide professional results, with an assortment of greetings and clip art to accent your photograph. It's the perfect mix of the impulses to show off and share season's greetings.